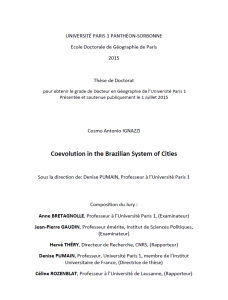 The ERC GeoDiverCity will organize an International Workshop in October about “Theories and models of urbanization“. 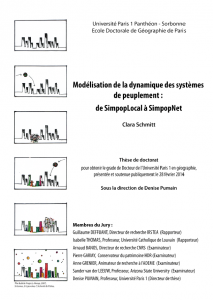 The ambition of the meeting is to engage discussion about fundamental questions regarding urban theories and modeling. Invited keynote speeches will be followed each by a roundtable of discussion. Related major results from the ERC will also be presented. The intention of the workshop is to summarize the state of knowledge and prepare an agenda for future research. The provisionnal programme and the procedure of registration can be found on this dedicated page. The unbridled and three-dimensional development of Chinese cities is spectacular. It has been initially concentrated in the coastal area, since the economic reorientation of the Chinese economy and its productive system has at first been based on export-oriented manufacturing. The coastal cities, more open to the World than the central and western ones, have provided leverages for this development. Their driving role has been strongly reinforced by the creation of the Special Economic Zones (SEZ) since the 1980’s, firstly implanted in this area. However, the recent evolution of the Chinese economy and society could shift the scheme of an economic development based on coastal cities, and the current highest growth could be very different from the cities growth economic potential. A typology of the demographic trajectories of Chinese cities from 1982 to 2010 (Swerts & Liao, 2016) including all cities above 10 000 inhabitants according to an harmonized definition (Swerts, 2013) highlighted that cities whose demographic weight increases in the Chinese system are not only located in the East coast, but also in Central and Western China (figure 1). 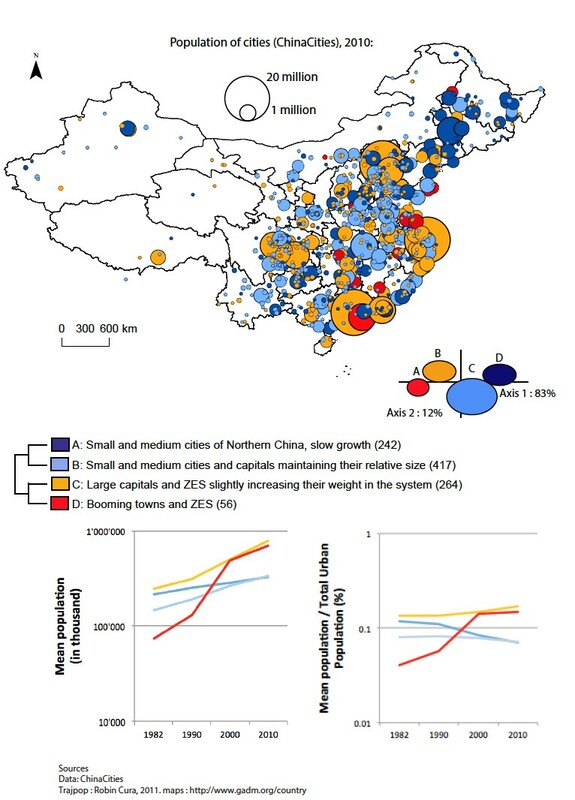 In terms of size categories, the most dynamic Chinese cities were both million plus cities and small cities (from 10,000 to 100,000 inhabitants). The fastest growing small towns are mostly located at short distances of about 200 km around the largest metropolises. 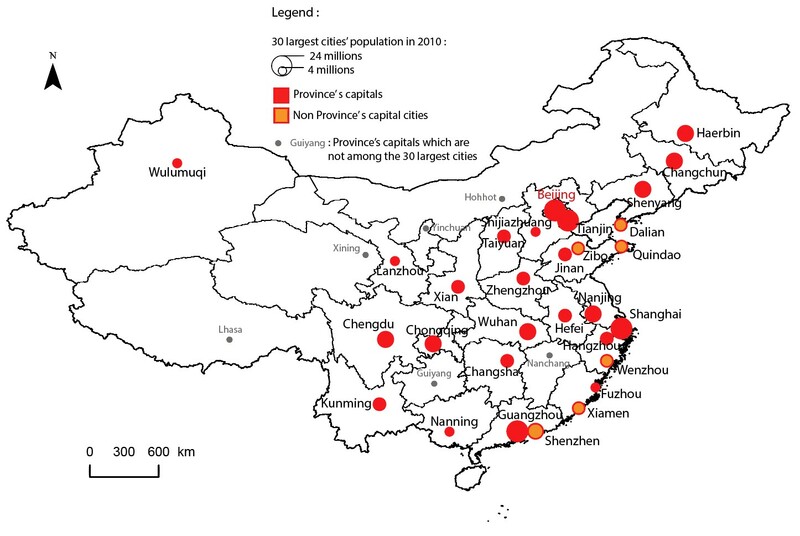 The increasing weight of some small towns and the stability of some large cities, as well as the current development of the Central and Western cities, could partly result from the strong emergence of an internal market, the increasing role of the tertiary sector in the Chinese economy and the more frequent creation of SEZ in Central and Western part of the country since the 1990’s. On the other hand, while the development of Chinese cities is highly linked to the evolution of the administrative system (Ma, 2005; Lin, 2005), the Chinese government has decreed successive decentralization reforms. These reforms could have fostered the economic development of the prefecture level cities and of the district level cities, the smallest ones. 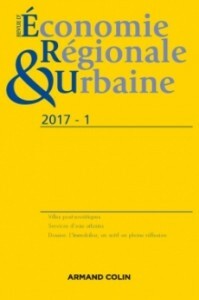 These changes could also generate long-term transformations of the functional organization of the Chinese urban system: including the expansion of the tertiary sector and the diversification of the cities’ economy and a strongest development of industrial activities out of the Eastern coast. 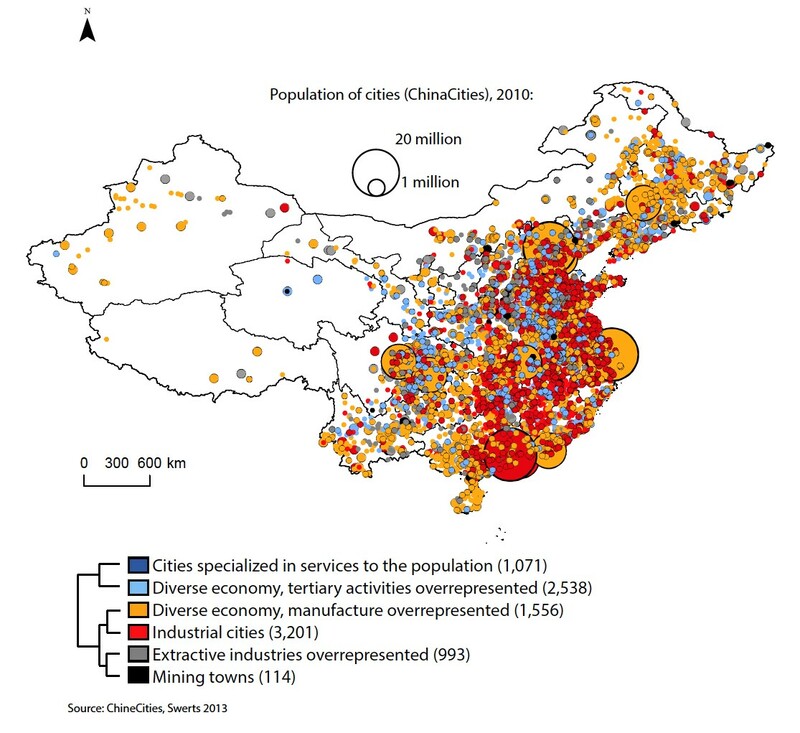 The cities of the central and western part of China are mostly cities whose economy is diversified, some of them with an overrepresentation of manufacturing activities, and others that are mostly cities of less than 100,000 inhabitants, with an overrepresentation of tertiary activities (figure 2). 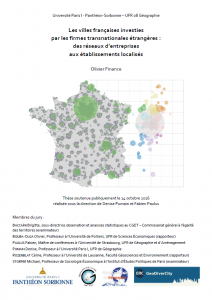 Nowadays, the economic profile of the most dynamic cities is very diversified. The strongest potential for economic growth could thus shift from the Eastern coast to all over the country, although a strong growth still remains a characteristic of industrial coastal cities, in particular those in the Yangzi river delta, the Pearl River Delta and the area around Beijing. International newspapers recently pointed out nine cities that reflect the strong potential of development of western and central cities, including a few non-metro cities. These cities are Chongqing (7.3 millions of inhabitants), Chengdu (6.4 million), Zhengzhou (4.1 million), Guiyang (2.4 million), Huainan (1.4 million), Xiangyyang (1.1 million), Suqian (274,594), Hengyang (165,824) and Zhuozhou (152,709). 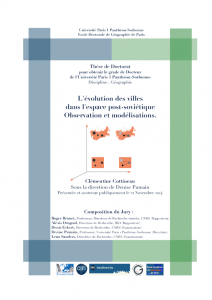 They are all cases illustrating the spatial deconcentration of the Chinese economic development (Fig. 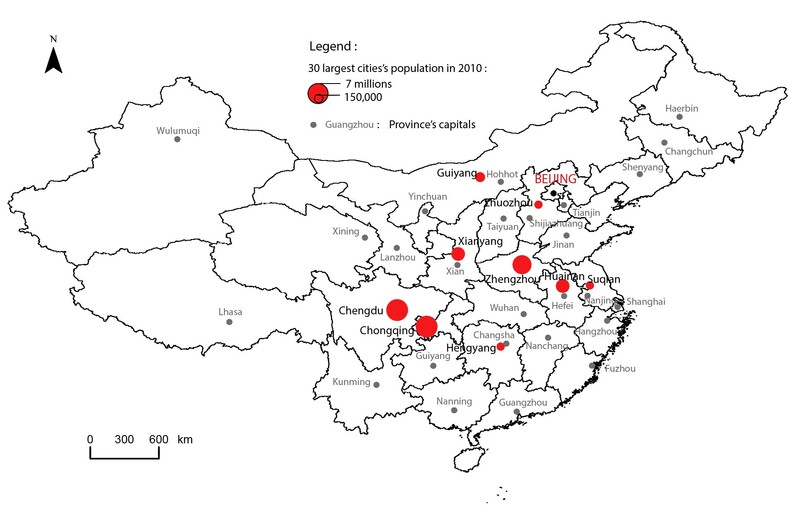 2 & http://geodivercity.parisgeo.cnrs.fr/blog/2013/10/the-first-image-of-functional-specializations-among-chinese-urban-agglomerations/), as all are located in the Central and Western part of China (Fig 3). These cities are very different in size, from some 150,000 inhabitants to more than 7 millions. This diversity is representative of the dynamics primed in China since the 1980’s. Some of these cities are province capitals, as Chengdu and Zhengzhou – and the Province level city Chongqing. The others cities are located between 50 and 250 km from their Province capitals. Zhuozhou excepted, all of them are prefecture level cities. 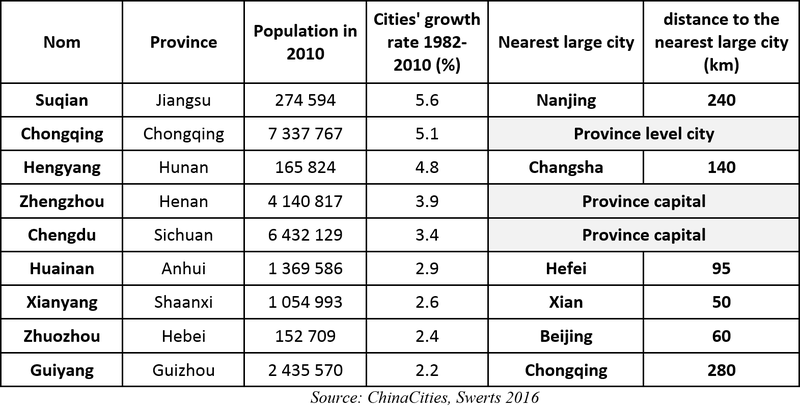 In average, the Chinese cities annual growth rate between 1982 and 2010 is 3.3 % while the annual growth rate of these cities vary from 2% (Guiyang) to more than 5% (Chongqing or Suqian). These nine cities all have a diversified economy with an overrepresentation of the innovative tertiary sector, Huaibei and Hengyang excepted. In Huaibei, 40% of the employed population (source ChinaCities) is engaged in manufacturing activities, whereas 22% of the employed population of Hengyang is engaged in manufacturing, and 23% in building industry. This last city’s economy may be not so sustainable. From an investor point of view, urban growth rates over 4 or 5% or even 10% are attractive, but it is well known that rapid urban growth always occur with high fluctuations in space and time. Knowledge about deliberate national policies may help to secure predictions but more detailed information about the evolution of economic profiles on comparative basis also may enlighten further perspectives. 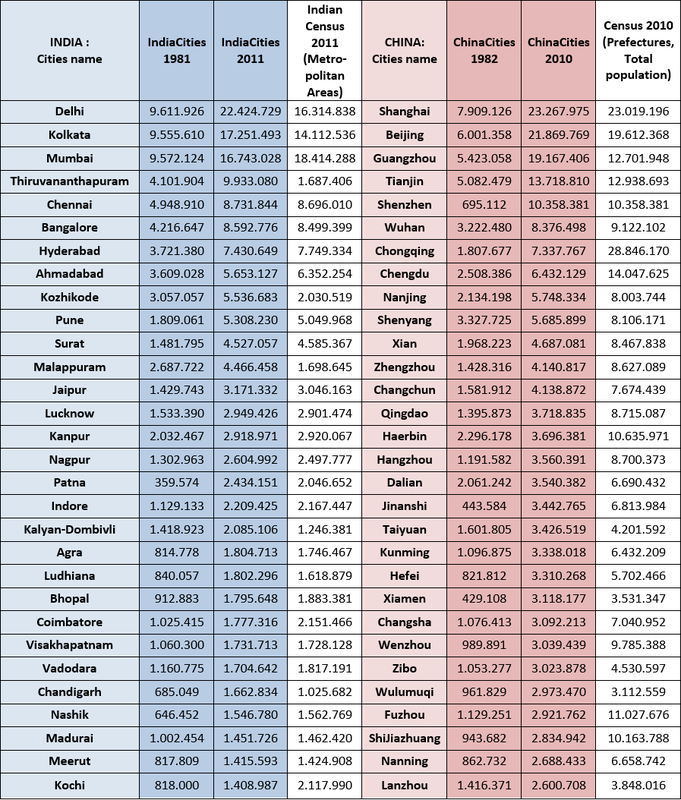 How large are Chinese and Indian cities? Reliable figures of cities’ population sizes are a great and useful by-product of comparative geographical analysis. We have identified which are now the major urban concentrations in the largest two countries of the world. Table 1 below provides the list of the population in top 30 Indian cities in 1981 and 2011 and top 30 Chinese cities in 1982 and 2010. In this table the last column on the right side enables comparing our results with figures that are given in official censuses of each country. The multisecular Chinese and Indian urban development that intensified since the 1980’s fascinates the observers, largely because it has produced supersized cities, as Shanghai, Delhi and Beijing counting each around 20 million inhabitants. These cities are and will remain on the list of the 10 largest Urban Agglomerations in the World. They do not yet reach the size of formerly developed urban concentrations around Tokyo (38 millions in 2015 according to the United Nations, 43 according to PopulationData.net) or even New York (19 millions in 2015 according to the United Nations, 23 according to PopulationData.net ) but due to their growth rate it is very likely that during the next decades, gigantic conurbations will organize around them: in China three megalopolises are already forming between Beijing and Tianjin, from Shanghai to Nanjing and between Guangzhou and Hong-Kong (including Shenzhen, Dongguan and Zhuhai) (figure 1). In India, the same could occur around Delhi and Kolkata, and from Mumbai to Pune (figure 2). 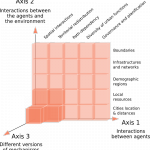 In Kerala the deviations between our database and the census in tentative sizing the agglomerations of Kochi or Thiruvananthapuram reflects the very peculiar expansion of urbanization in that region, which tend to mix very dense urban and rural areas in a way slightly different from Indonesian or Chinese “desakota” (McGee, 1991). 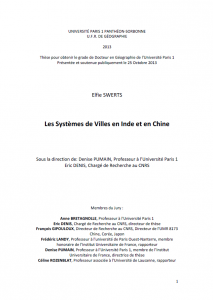 Gigantic efforts have been made by many authors for establishing safer figures on the size of urban agglomerations in a comparable way and avoiding big mistakes as in papers electing Chongqing as the largest “city” in the world. Chongqing was supposed to reach from 32 to 34 million of inhabitants 1 because of a confusion in translating the Chinese word for “municipality” that may indeed denote a “province” (in that case covering 82 300 km2, approximately the size of Austria!) 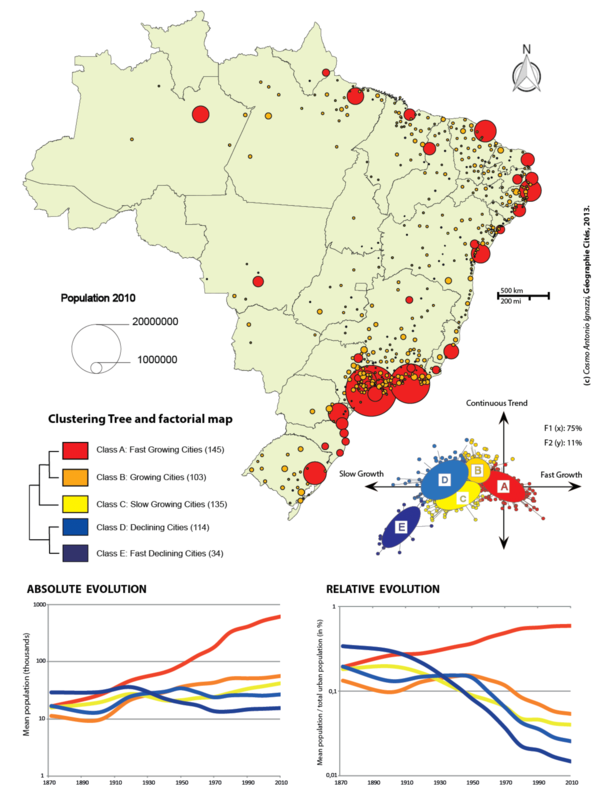 whereas the population of the agglomeration, although already large enough, oscillate between 7 or 10 millions according to different sources. 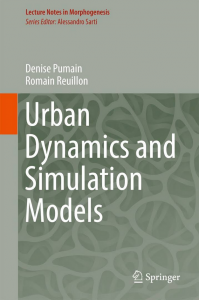 Of course for comparing cities and assessing dynamic urbanization processes building data base where the size of cities is comparable in time and space is absolutely necessary and this step of the work was duly accomplished in GeoDiverCity’s work, for Europe (Rozenblat, 1992; Guerois et al. 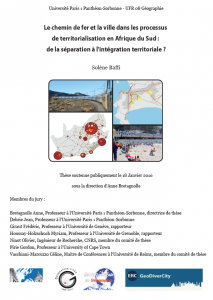 2009), Former Soviet Union (Cottineau, 2014), India (Swerts, 2013), China (Swerts, 2013), United States (Bretagnolle et al., 2015), Brazil (Ignazzi, 2015) and South Africa (Baffi, 2016, Vacchiani-Marcuzzo, 2005). 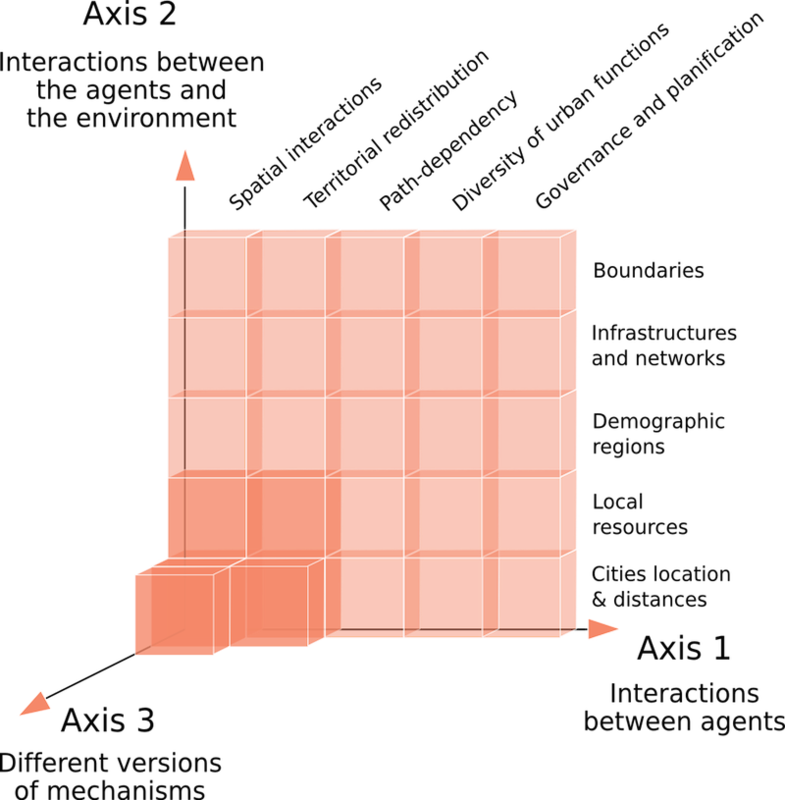 All these data bases will be made freely accessible in due time, including detailed information about their methodology and metadata. 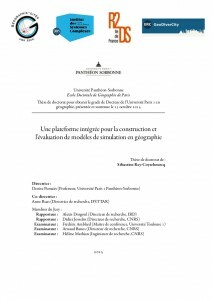 The methodology employed by Elfie Swerts for building the data bases on India and China is made explicit in the annex in the full post.